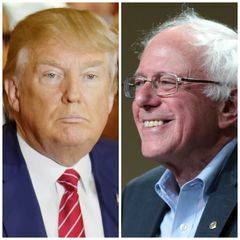 Can “extremist” candidates like Bernie Sanders and Donald Trump win general elections? Are they “electable”? The correct answer sounds like a cop-out. Most importantly, it depends on the state of the economy. But these candidates’ broad support also tells us something interesting about how political elites – like elected officials, candidates and activists – think about electoral politics. With respect to presidential elections, political science is relatively clear on how general elections proceed. When the economy is growing at a healthy clip, particularly during the first half of an election year, the party in control of the White House tends to keep control. When it weakens, the White House changes hands. There are other factors, but the effect of the economy tends to be strong enough that most of the other factors just cancel each other out. In their review of the 2012 election, for example, George Washington University’s John Sides and UCLA’s Lynn Vavreck show how most of the supposed “game changers” throughout the campaign did little to move the polls, which eventually gave the victory to the incumbent, as we would expect with a growing economy. According to Federal Reserve Economic Data, the economy grew at 2.7 percent during the first quarter of 2012, and 1.9 percent during the second quarter. When the economy is growing more tepidly, as it is today (fourth quarter growth in 2015 was only 1 percent, again according to Federal Reserve Economic Data), individual candidates can have a more important effect because the fundamentals predict a closer election. One of the factors with a small but measurable effect is ideological extremism, or at least the perception of it. In a 2001 article from the journal PS: Political Science and Politics, Larry Bartels and John Zaller show that there is an electoral benefit to appearing moderate, which most people find intuitively sensible. Bernie Sanders is more ideologically extreme than Hillary Clinton, and he would be correctly perceived that way, in part because he embraces the label of “socialist.” That probably gives Sanders a lower share of the vote than Clinton would receive in a general election. Trump is more complicated, since his past embrace of liberal policies muddies the question of where he fits on the liberal-conservative spectrum. One could look at his past support for single-payer healthcare, tax increases and abortion rights, and classify him as a liberal. One could also look at his current support for tax cuts and abortion restrictions, and classify him as a conservative. Or, one might conclude that he simply doesn’t fit on the conventional scale because of his inconsistency. Mostly, those who classify him as an “extremist” do so on the basis of his current support for restrictive immigration policies, ignoring his past policy positions entirely. When it comes to choosing a candidate to support, however, elites must decide not just which candidates’ platform is most appealing, but who is most likely to win, and that requires thinking about how centrists and extremists perform in a general election. And not everyone believes that centrist candidates have an advantage. Right or wrong, that belief matters. One of the most actively researched topics in politics today, particularly in Congress, is how far apart the parties are, ideologically. Less well understood, however, is why Republicans have moved farther from the center than Democrats. The most common measure of ideology in Congress is the “NOMINATE” score, developed by Keith Poole and Howard Rosenthal, and the scores show a clear difference between how extreme the parties have gotten. In a recent paper, I began thinking through the role of elites in this process and, in particular, how party elites on both sides of the partisan divide understand the electoral process. An examination of the narratives elites tell each other to explain their losses suggests that many elites, particularly Republicans, don’t believe that centrism is electorally beneficial. Many Republican elites think of the roles of extremism and moderation through the lens of two candidates: Barry Goldwater and, of course, Ronald Reagan. In 1964, the Republican convention faced an election they knew they would probably lose. They had to decide, then, between a candidate who might put in a strong showing, like Rockefeller, or the candidate viewed as the true conservative, Barry Goldwater. I would remind you that extremism in defense of liberty is no vice. And let me remind you also that moderation in pursuit of justice is no virtue. As the nominee, Goldwater didn’t just lose, he lost in a landslide. Had the Republicans nominated Rockefeller, they still probably would have lost, but by a narrower margin. However, Goldwater’s campaign was not the only event important to conservatism in 1964. Goldwater’s candidacy was a manifestation of the belief posed by conservative activist and lawyer Phyllis Schlafly in her 1964 book, A Choice Not An Echo. Schlafly argued that there was no point in nominating a moderate, and that if Republicans nominated a true conservative, voters would reward their conviction. While this strategy didn’t work for Goldwater, the idea has only grown in power within the Republican Party, culminating in the nomination of Ronald Reagan in 1980, who remains the central figure in the Republican mind. Many observers, including former President Ford, thought that Reagan’s nomination would guarantee victory for the Democrats because of his ideological extremism. However, the economy was bad enough in 1980 that while Reagan probably lost a few points for his lack of moderation, he won anyway. This convinced many Republicans that pursuing centrism is a fool’s errand, and the subsequent losses of candidates like McCain and Romney, who were both distrusted by conservative activists, have only strengthened the belief among Republican elites that they win when they nominate conservatives, and lose when they nominate moderates, spurious though the claim may be. This belief seems to be playing out slightly differently in 2016, for reasons that are not clear yet. On the Democratic side, Bernie Sanders appears to be the Democratic manifestation of the previously Republican line of thinking. The current debate is whether Sanders would be Barry Goldwater or Ronald Reagan. He is either an extremist destined to lose, or the leader of a nascent political movement that will grow in power when he defies expectations and wins the presidency on the basis of previously unmobilized masses. His level of support suggests that the Schlafly line of thinking has taken hold among some in the Democratic Party too, even though he probably lacks the support to win the nomination. The bigger question mark is Donald Trump. The current leader on the Republican side is not an extremist or a moderate. He is ideologically incoherent, given his flip-flops on nearly every major issue. While Mitt Romney was attacked for ideological inconsistency, even he never went so far as to advocate single-payer healthcare. Trump did. We don’t have data on how such a candidate might fare in a general election, and he has already far surpassed expectations, so perhaps we should not write him off as a general election loser either. Nevertheless, the fact that Republican establishment leaders are so worried about someone they don’t trust as a conservative suggests a persistent belief in Schlafly’s model among some Republican elites. Making matters more complicated, Schlafly, herself, supports Trump, emphasizing how difficult it is to place him on the traditional, liberal-conservative spectrum. If Trump loses, though, what will matter for Republicans is how they explain his loss. They might write him off as a RINO (Republican In Name Only) and attribute his loss to his past support of liberal policies. That would push the party farther to the right. They might also decide that the difficulty of placing him on the liberal-conservative scale makes it impossible to draw any lessons about the importance of centrism. They may even attribute a loss to his extremism, and begin moving back to the center. Then again, Trump might win. Regardless of what happens, it will be important to study how Republican elites explain the result. While some in political science have argued that party elites effectively control the nomination process, Trump’s success this year shows that the elites aren’t as strong as some believed. However, the way they interpret losses will almost certainly influence the general direction of the party.